L ocated in the Northwest corner of the United States, Washington State is the 42nd state, admitted to the union in 1889. It is bordered by the Canadian province of British Columbia to the north, Idaho to the east, Oregon to the south and the Pacific Ocean to the west. The state is divided by the Cascade Mountains. The area to the east is referred to as Eastern Washington and conversely, the west is known as Western Washington, where approximately 60% of the state’s residents live. 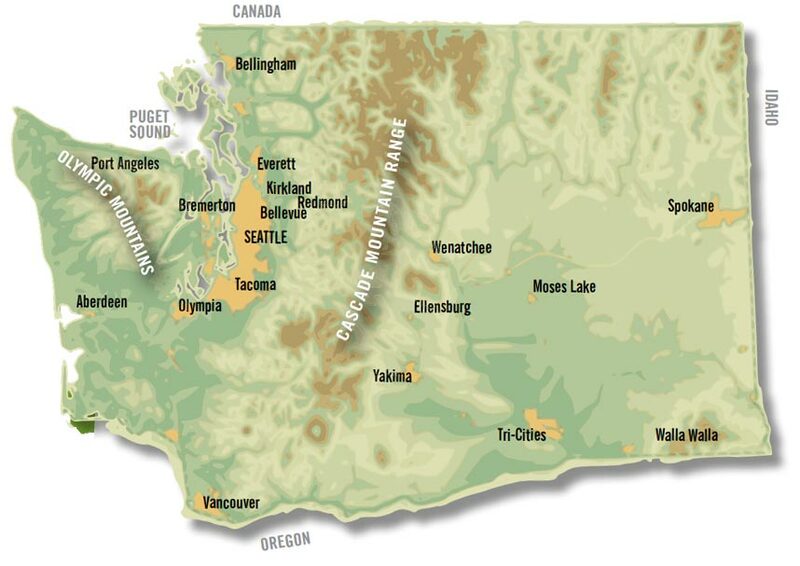 The Cascades and the Olympic Mountains create tremendous geological diversity in the state. Along the coast, you’ll find a temperate rainforest and quaint beach communities. The Puget Sound region is characterized by deep natural harbors and bays and major population centers. Eastern Washington is semi-arid, a perfect growing region for the 300 crops that grow in the state. Hurricanes, tornadoes and blizzards are not part of the daily weather reports in Washington; the weather is comparatively mild in comparison to other U.S. states. The state is the 18th largest in the U.S. with 71,300 square miles of land. Washington is 240 miles long and 360 miles wide and has a population of 7.42 million. Washington is in the Pacific time zone of the United States (UTC -8/-7). Sure, we could extol the virtues of our robust economy and depth of our industry sectors, but sometimes it’s the little things that make a big difference. Check out our Top 10 list of things that make Washington a great place to do business, from our diversity and pioneer spirit to our unbridled creativity. Washington State comes out on top in a number of key national rankings. Find out what others think of us and learn more about some other numbers that make Washington unique in the world (didn’t know we had 900 wineries, did you?). Washington’s relatively mild climate is closely tied to the state’s geography, so it’s only natural to cover them both in one place. From the rainforests along the Pacific Ocean to the dry, rolling plains inland, Washington has a climate to suit nearly anyone. If you travel on business or like to go on vacation now and then, knowing how to get around is important. Find out more about our transportation system, from direct flights to international destinations to visiting relatives across town or across the country. From early logging and coal mining industries to the dawn of the information age, Washington’s economy has been characterized by opportunism, resilience, perseverance and a unique frontier spirit that continues to define and permeate our culture. When the work day has finally ended, Washington State offers plenty of diversions, including professional sports, the great outdoors, world-class restaurants and theaters, and lots of places where you can enjoy one of our famous picture-postcard sunny days. If you have a secret love of kung-fu movies, know if the price is right, enjoyed an evening where everyone knows your name, or always wondered how the professor could make a radio out of a couple of coconuts, then you probably know some of our famous residents. Washington State also has its share of famous businesses. From Boeing and Microsoft to Amazon, Costco, Nordstrom, Paccar and Weyerhaeuser, Washington is home to many legendary businesses that are known and respected around the globe, including many members of The Century Club.